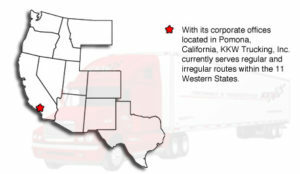 KKW provides tailored local truckload and dedicated contract services for those customers whose needs demand customized or dedicated transportation normally associated with private fleets, but does not wish to tie up capitol on equipment assets and/or human resource nor the significant liabilities associated with a trucking operation. Our local truckload and dedicated fleets currently operate in all the major cities in the west. KKW can also provide warehouse services or “Four Wall” management tailored to fit your specific needs. Those tailored services can include transloading, consolidations, de-consolidations or simply general warehouse space. This added capability together with our trucking services throughout the West makes for an almost seamless “one stop shop” for the distribution of your goods. New to our lineup is our logistics arm that can handle most if not all the warehousing and transportation services that are outside of the KKW Truckload or Dedicated Fleet Transportation and Service lineup. Please contact Mark Knickerbocker at (909) 869-1260 or via email at mknickerbocker@kkwtrucks.com for a rundown about the services that KKW Logistics can provide. Let us show you how we can put our many years of experience in distribution solutions to work for your organization. KKW Trucking, Inc. offers competitive and specialized service with air ride, high cube equipment, logistics management and top notch customer service. KKW has also excelled in the furniture transportation business for nearly 47 years and can provide other specialized services to other locations upon request. **KKW has become noted by its customers for its on time service performance and its “can do” attitude.